A good friend sent me a simple recipe for Jalapeño Salt and it started me thinking about the batch of Smoked Chipotle Peppers I made a couple of weeks ago. (I left half of the batch as dried peppers, and put the rest in an adobo sauce.) Then I remembered we already have Smoked Ghost Pepper powder in the freezer from last year's pepper harvest. 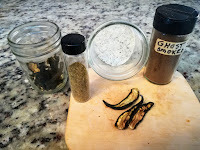 So I ground some of the Chipotle Peppers into a coarse powder, and put everything together to come up with my version of Phantom Chipotle Salt. Enjoy! Add all ingredients to a jar and shake well to blend. Done! This salt can enhance the flavor of just about anything. There is just enough back heat with a pleasant overall smoky flavor. This would be good on steaks, popcorn, eggs, grilled corn on the cob, potato salads, etc. Use on just about any meat, vegetable, or soup, guacamole, salads, even on the rim of a Bloody Mary or Margarita glass.